Robotic surgery has rapidly progressed into the mainstream of modern surgical practice. The da Vinci® Surgical System (Intuitive Surgical Inc., Sunnyvale, CA) has been particularly embraced by the urologic community. Some of the urologic applications include pyeloplasty, cystectomy with diversion, adrenalectomy, pelvic floor reconstruction, nephrectomy, and partial nephrectomy.1–6 However, the robotic system’s largest impact has been in its use for radical prostatectomy. 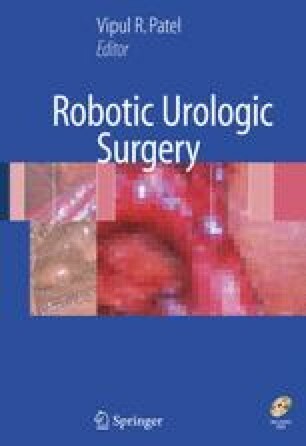 It has been calculated that in 2005, 20% of all radical prostatectomies performed in the United States are performed using a robotic platform, and that number is projected to grow significantly. International usage is also gaining increased acceptance.